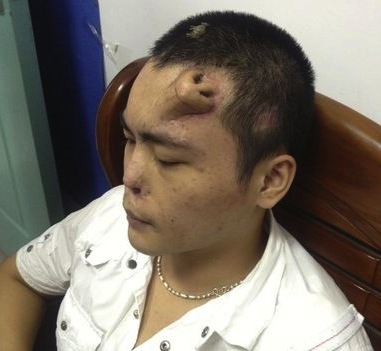 Ermagerd, a doctor in China surgically grew a new nose on the forehead of a 22-year-old man whose original nose became infected after a car accident. The procedure took place in the Southeastern Fujian province, and is said to be the first of its kind. So what did you do today? Oh, that’s nice, but while you were grocery shopping or twerking on dwarves to “Thrift Shop,” OTHERS were growing noses on their foreheads, you know, being medical marvels. I’d like to note that one American doctor who commented on the surgery said the cartilage is currently in its most sensitive state and may fall apart at any moment. “If he gets a little infection the cartilage can disintegrate… [what looked like a nose] now looks like a blob,” Byrne, ever the optimist, said. PFFFT so there’s a nose on your head… we hope it doesn’t melt. Good luck with that. Do you even science?